The tables that I present here focus solely on the acid/alkali effect of food after it has been digested. There are other factors that you must consider when planning your diet to avoid problems with general health. I cover these principles in more detail in my Diet Section – these charts simply cover food acid-alkaline values for assessing your food diary. To help you plan your meals, I have prepared a number of tables that analyze the food items from the USDA National Nutrient Database. I use a technique developed by Remer and Manz. PRAL (Potential Renal Acid Load) gives a simple method to calculate a value that gives a good indication of the acid or alkaline effect of food. The calculation is described in “Dietary potential renal acid load and renal net acid excretion in healthy, free-living children and adolescents”, which I explain, in detail, elsewhere. Before I introduce the tables, a few words of warning. PRAL gives a precisely calculated value based on the nutrients contained in 100g of food. This value can vary due to many factors including variety, growing conditions, season, and cooking method. Not only that, but digestion varies from person to person, and at different times of the day. Use PRAL values as a guide – the real measure of your progress can only be determined by measuring the pH of your urine. This is a simple process using widely available test strips or meters. Though I present the figures for 100g, many food portions will be much smaller than this. You will eat herbs, spices and other flavorings in much smaller portions. Unless these foods are a significant portion of your diet, or they are particularly potent, you can simply ignore them. I give an exact figure for PRAL, but you should only use these tables as a guide. They are useful for you to see, for example, which food will help alkalize your body better than another food. I’ve categorized the values into columns, and it is these that are most important. The column categories range from very alkaline, negative numbers to very acid, positive numbers. Just because a food is an acid does not make it a bad choice. You should choose an acid food as your main protein source, then balance it out with a selection of alkaline foods. Finally, it is wrong to try and balance an excess of acid foods by taking an excess of alkaline foods. If you want a meat or fish based meal, choose a small portion, then bring it to around neutral with a good selection of vegetables etc. You should try to make the other meals you eat that day alkaline in total. The USDA database that I use for my tables has a number of different groups. I have prepared a table for each of these groups, except for “baby food”. You should seek as much variety as possible, choosing from each table. You must not ignore acid-producing foods – these should make up 20-40% of your calorie intake, with the balance from alkaline foods. A good diet needs variety. The only way you stick to a well planned diet is to eat tasty satisfying food. From coriander to mustard, use spices and herbs to make your food interesting. Can fats and oils be good for you? Get the pH balance right, and no food is bad. Choose the right dressings for your meals and enjoy your healthy diet. See the latest Alkaline Oils List. Where do you find which foods to avoid? Do you simply avoid meat? Don’t chicken out – you’d be a turkey to avoid all these foods. Wondering what food to eat for a healthy diet? You can eat anything if you balance your meals properly. Look at sauces from Worcestershire sauce to a little bit of gravy to make your meal delicious. What food should you avoid? Anything that makes your health worse. But if you follow a good pH balanced diet plan you can eat anything. Including salami and meaty spreads. What are health producing foods? All food if you balance your diet, no food if you don’t. Start the day with a well balanced breakfast, then continue this good food habit throughout the day. See the latest update to alkaline breakfast list. Fruit foods for health. Fruity snacks and sauces can help make all food good for you. From apricots to pears, see how to balance your diet with fruit. Be sure to check out the new Alkaline Fruits List. Are you looking for food to avoid? Look no further – it doesn’t exist. With a proper pH balanced you can combine any pork products in your diet, but don’t make a pig of yourself. If you want good healthy foods look at vegetables. You don’t have to be vegetarian. Just add enough vegetables to your meaty meals and say goodbye to acid diet problems. Be sure to check the new Alkaline Vegetables List. Are there any foods that reduce acid? All food can do if you plan it properly. Balance all foods that you eat, including nuts and seeds, and watch your pH level rise. Also see the Alkaline Nuts List. Do you know what unhealthy food is? All Meat? Beef Products? Think again. With a properly balanced diet you can eat anything from beef suet to liver, as long as you add enough alkaline foods to your plate. Are you obsessed with food? What about drink? From tea to low calorie flavored water, choose drinks that help you balance your pH level. See the new alkaline beverages list for popular drinks and more nutrients. Also, check out the complete Alkaline Alcoholic Drinks List. Is fish food bad Some think it’s only shellfish. In fact there is no bad food, just imbalanced diet. Balance your diet and you can eat any fish from clams to cod. Looking for food to avoid? Be careful, you could end up eating nothing (and that is unhealthy). Balance your diet properly and you can eat anything. Find legumes for pH balance. Do you think lamb, veal and game are foods to avoid? Think again. Choose wisely. Balance well. You can enjoy any food if you plan your diet properly. There are no bad foods, just foods eaten badly. Baked products can be good or bad for your health depending on how you balance them with other foods. Food that helps improve your diet is all around us. If you plan meals properly you can eat almost anything you like. Why not celebrate with a delicious sweet. You’ve earned that pudding. Searching for food to avoid? Any food eaten badly can cause health problems, but food eaten well always helps you. Plan to balance your diet and you can eat anything from cereal to pasta. Also see the Alkaline Pasta List. Food and health go together. Don’t give up food – starvation causes ill health through malnutrition. Instead, look for balanced meals. Even fast foods are OK if you know how to balance pH. Good food is all around us. You simply choose the right selection for pH balance and watch your health improve. Even ready meals can help you if you make the right choices. When compiling your food diary, don’t forget about snacks. Regular frequent meals avoid starvation and overeating that helps keep you healthy. Balance your snacks from chips to pork skins. Wondering what food to avoid? Any food is bad if it’s not eaten as part of a balanced diet. Plan your meals properly, and you can eat anything, including ethnic foods from agave to whalemeat. Alkaline food charts should help you plan a diet that keeps you healthy while including your favorite foods. So, it is important that you understand the principles of alkaline diets. Because many dieters get too obsessed with alkaline foods without considering the need for acid-alkaline balance. Remember that you can ask about alkaline foods any time you need more help. Or use that link to share your experiences and opinions about alkaline food charts. To read the document change history, click the Foodary History image on the right. 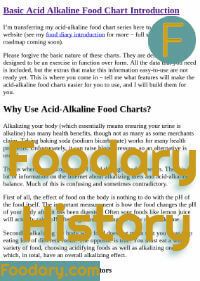 Do you have suggestions for improving Acid Alkaline Food Chart Intro? Then, please add your idea to Foodary Suggestion Box. Or, send the Feedback Form, below. Why can’t I access all of chart please can’t get into beef or nuts and seeds for example? I have not found the time to transfer them from my health website to this nutrition site. I will get them done as soon as I can, in the meantime, you can follow the above link for the full list. The charts are now transferred, except for the ethnic foods table. This got deleted from the old site before I finished transferring, due to lack of interest. If you want it back, please ask by way of a comment here, explaining why it is important, and I will see if I can retrieve it. Grateful for your work in making these charts available. I ran into two small problems. I was trying to find a value for vinegar and thought it would be under gravies and sauces, thinking it might relate to sauces. Later stumbled upon it under herbs and spices. Problem solved. Then second problem. Since I’m trying to calculate recipes enough to adequately offset acid ingredients like meat, I need quantities in a recipe-friendly form. It could well be I just missed it, but didn’t see anything to tie vinegar to tablespoons. Found your site after being made aware of the whole acid/alkaline problem by the book Building Bond Vitality by Lanou and Castleman. You might want to mention the book on your site. Now that I understand more about acid/alkaline and other bone-building issues I didn’t know about in time, I realize that osteoporosis is not a disease. It is a form of starvation, like scurvy, beri-beri, or goiter. And gout? I’m sorry things are so slow round here, and I will try to find more time to get the acid-alkaline food charts finished, then I can get started on the more interesting part of this project – the food diary. That will have features that allow finding food items easier, as well as easy ways to assess recipes and different serving sizes. For the moment, there is an excellent search facility in the bar at the top of each page, which makes finding vinegar, or any other diet item, very easy. I just want to thank you. I don’t have gout but I’ve been housebound – often bedbound – with auto-immune problems that MDs don’t know how to treat. Several years ago I read about the damage that low pH can cause. At the time my pH was 4.5-5. Using the misleading (often lying) charts found online, it took me several YEARS to get my pH up to 6. Using YOUR charts, I’ve been able to increase my pH from 6 to a healthy 7-7.5 in just a few DAYS! (Can anyone say Parsley Soup?) I am now ready to eat a more balanced diet and I feel much, much better. Thank you so much for your diligent work. (I’ve seen several USDA databases… It takes a lot of work to reorganize them into something useful and publishable.) I know you’ve already helped to save lots of lives, so thanks again and God bless. Thank you for your kind words, Christina. You have given me fresh impetus to finish moving the acid-alkaline food charts here, and then moving on to the more serious job of making them easier to use. Also, there are other health aspects of nutrition that I want to cover, such as excess iron. I am really pleased the charts have helped you. Parsley soup sounds interesting. Do you have a recipe? I’m sorry that the information is not clear. I am trying to improve it, but time is a problem. Though the process is simple, it is very long-winded, as you have to add up the values of everything you eat and drink everyday. This is why I want to automate the food diary to save you time. It may be a few months before I can make this happen. You need to look at your entire diet not just one item. Even then, the food charts are only a guide, and you have to confirm the changes within your own body by testing the pH of your urine. This can give fantastic benefits as Christina noted above. The process is only slightly related to gout, which is why I moved these food charts to this website. At this stage, you would be best reading all my diet for gout information, then asking any questions in the gout forum related to that site. hi,can you please clarify why every value has minus sign,is -3 more acidic than -13 or is this reverse,plz clear its quiet confusing for layman.if you can reply to my email it would be very appreciable,very thanks for your great work. Sorry for the delay, Daisy. The truth is, this website needs a lot of work to make it clearer. Minus values only appear on foods that have an alkalizing effect, so -3 is less alkalizing than -13. “Acidic” does not get considered for foods with a minus value. I would also avoid it for plus value foods. They are acid-producing, which has a different meaning. The essence of alkalizing diets needs to be considered in the context of a typical Western diet. These diets, mainly because of the high protein content, acidify the body. The tables are only a guide to help choose better options once you have analyzed your entire diet. The true test comes when you measure the pH of your urine. 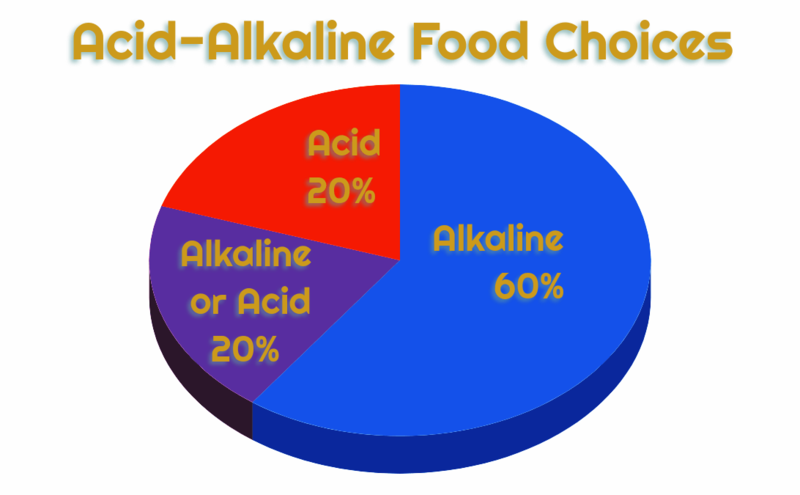 Your diet must comprise a healthy mix of acid-producing and alkali-producing foods, with an overall alkaline (i.e. minus) balance. Should nt raw tomatoes be considered acid?? I can think of no good reason why raw tomatoes should be considered acid in the context of these PRAL charts. There are, of course, other contexts besides an alkalizing diet. If you’d care to add a bit more background as to why you are asking your question, Adrien, I’ll try to give a more enlightened answer.